Launch your fighters in the heat of battle and send your squadron into the future of Star Wars: X-Wing with the Galactic Empire Conversion Kit. 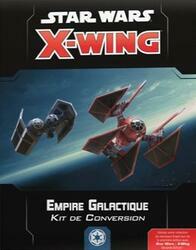 Contains the necessary items to use your Imperial Star Wars collection: Star Wars: X-Wing Second Edition, including ship cards, upgrade cards, and ship markers. The maneuvering dials correspond to the following vessels: TIE bomber (3), TIE fighter (4), VT-49 decimator (3), TIE defender (2), TIE interceptor (3), Class shuttle, Lambda (2), Star Wing Class Alpha (2), TIE Advanced (2), TIE Aggressor (3), Inquisitor TIE (3), TIE Phantom (2), TIE Punisher (2), TIE Striker (3).